The seven furniture pieces that brighten a room allow you to skip the hassle of painting again if you chose a shade for the walls that's a little too dark. They'll take a den-like dark area and add a spark of life back in without necessarily costing a fortune. Light colors, a lack of clutter, mirrors and more help take a room from drab to cheerful - no taping and painting the walls necessary. If you're starting to regret the dark color you painted a room because of its oppressive, cave-like feel, choose white furniture. Even a white slipcover on an old sofa will work if you didn't plan on a complete room makeover. 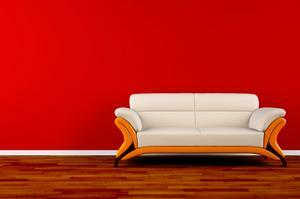 Pick up used furniture you can paint white and the room will brighten back up in no time. If the room calls for it, white wicker furniture can creatte a breezy feel despite the dim lighting or a wall color that is overbearing. Dressers and cabinets with large mirrors-especially when across from a window with a great view-can really brighten up a room and make it appear even larger than it is. Choose a wide dresser with a mirror for a bedroom and put it in an area where natural light can bounce off of it. In another room where it wouldn't make sense to have a dresser, choose a large mirror to hang on the wall instead. An ottoman, cabinet, or bench will work as well as a coffee table as long as it's in a light finish and has hidden storage. This works because you'll be able to hide away the clutter that's bringing your room down. Once you have clean, sparkling tabletops and fewer magazines and knick-knacks within view, the room will seem instantly brighter. If the room isn't particularly dark on its own, you can get away with choosing a darker finish here. Just make sure there is plenty of light elsewhere in the room to balance it out. Floating bookshelves allow you to display your books without a massive bookcase. The lack of definitive lines will keep the room more open in appearance. Since you can only display a few books at a time, you'll be able to spread your reading collection out around the house rather than committing all of your reading materials to one spot and overwhelming a single space. If you don't like the idea of floating bookshelves, consider a tall, thin bookcase instead of a wide one of medium height. Intricate patterns and ornate furniture pieces are beautiful, and they probably have a place in your home. However, you may want to keep them out of the room you'd like to brighten up and use conventional furniture with clean, simple lines in their places. The simple surfaces will allow more light to bounce off and, as long as those surfaces are devoid of clutter (see number three), keep the room looking as bright as possible. Bold overstuffed chairs make the list of seven furniture pieces that brighten a room because you can choose to have them reupholstered in the perfect accent color or pattern for your room. As long as it's light or bold, the chair will instantly add drama and light to the room. Feel free to play with texture and make the chair a focal point. A bathroom vanity in a light color will do miraculous things for a dreary bathroom. In many cases the bathroom is the one that needs brightening most simply because the lighting isn't always ideal and there aren't always windows for sunlight to naturally brighten the room. A white or cream colored vanity with silver accents and a large mirror will not only give you somewhere to hide the toiletries that clutter up the small space, but it will also make the room appear larger and brighter. Stow your cleaning supplies away in the vanity cabinets for easy access; sparkling finishes on the sink, tub, and toilet will reflect more light and make the space more inviting overall. You can make small or extravagant changes to a room to make it brighter whether it's small or just dark. Reflective surfaces and light colors are the best things you can do to liven up an area. Textures and accent colors that pop against a darker backdrop will also help. If you fear that painting the walls may be the only option because it's less expensive than a total overhaul on a room, visit thrift shops and look on Craigslist for deals. A single piece of inexpensive furniture could be all it takes, and in many cases it's much more convenient than painting.